Bear was a very sweet guinea pig believed to be 8 - 10 years old when he arrived at GPF. He was well-loved by his former caretakers who no longer could care for him. He was on Enalapril, Metacam, and Furosemide for his heart and Glucosamine for his arthritis. He also was on eye meds and a topical cream for a skin problem. He lived with two cage mates and got along fine. At one point he had a seizure and needed to be propped up in his cuddle cup until he recovered. Three weeks later he had another seizure that he did not recover from. The cases of lice that I have had here normally were observed over the rump and/or behind the ears. 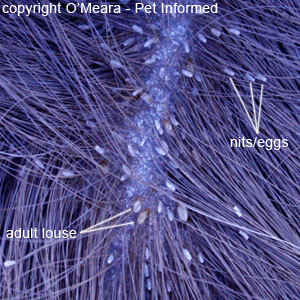 The lice usually are slow moving and the nits (eggs) can be seen attached to the hair shaft. Fortunately I have just had a few cases of lice here. The first were two side-by-side cage mates a while ago. I didn't know what to do so I gave them a bath and then combed them with a flea comb. I also cut their long hair and gave them a bath the next week. The next ones arrived here with lice and were bathed with Gorgeous Guineas' Lice 'n' Easy. The last case was Scooter, in the photo on the right, who had been here a while after he was returned severely underweight after two and one half years of adoption. Scooter was treated with a dose of Advantage. I also treated all of the other guinea pigs here as a preventative measure. 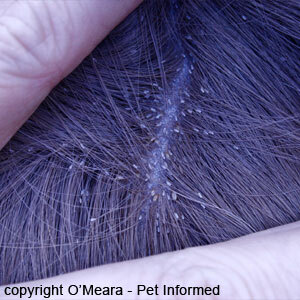 Prior to treating make sure that you or your vet see lice and/or nits (eggs) so the treatment targets the right problem. A photo of lice may be found here and a close-up photo of lice may be found here.